Hi bloggers, for my post today I’m sharing a DT card for Mama Makes made using the beautiful Doodle Dreams stamp set, I just love the sentiment from this set! • Cut a piece of mirri card to 5.5″ x 5.5″, and a piece of white card slightly smaller than this. • Take the white card, and using both colours of Oxide, randomly stamp hearts over it. • Mat the white card to the mirri, and glue both to the card blank. 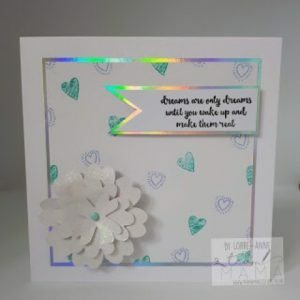 • Stamp the sentiment using Versafine ink, cut to a banner shape, and mat to a piece of mirri card. Use foam pads to attach to the card. • Finish by attaching the flower to the card using 3D glue. Be back soon to share another make with you all.